A year ago yesterday, there was an incident that occurred in our family that I have not shared with anyone online yet. The only reason I share it at all is not to make a statement in a very controversial issue, but to share the lesson that I learned. The truth is that I became a different mother on that day. Jude was exactly one year and eight days old, and like any good mother, I took him to the doctor to assure us all that he was a healthy little boy. The appointment went as routinely as it could. I reveled in that motherly pride over my child's growth and accomplishments. I was happy inside when I was assured that he was in as good condition as possible. Before leaving the office, we had to face the infamous immunizations. My happy feeling was gone, because even though I believe that vaccination is important and beneficial, I still feel the anxiety of the unknown. However, I agreed to abide by what was preferred by my doctor and the AAP. So when the nurse walked in and told me that he would be receiving five shots, I ignored that voice inside me that said five is too many. I ignored my own instinct, and listened to what someone else believed was necessary for my child. I died a little bit inside as I watched those five syringes being emptied into my screaming son. I reassured myself over and over that everything would be fine, and I told that voice to be quiet. We left that appointment and Jude's good mood failed to return. This is nothing out of the ordinary after receiving shots, so I took him home, cuddled him like crazy and laid him down for his nearly four hour nap, checking on him obsessively the entire time. When he finally woke up that evening, he still wasn't himself. He was lethargic, clingy and burning up. Jeremy and Jonathan ran out to pick up some pizza for dinner and while they were gone, I gave Jude some Tylenol, laid him down next to me on the couch and pulled out the doctors information to call and see if my concern was appropriate. Somehow, I knew something was wrong before I knew what was happening. Something inside me knew it all along. I knew he was having a seizure before I saw his arms seize up, before his lips turned blue and before he fell over, his body stiff and his eyes focused on the nothing above his head. To see your sweet baby in this state is sickening. I immediately snatched him up into my arms, I cried out his name, I kissed his head. He would not look at me or respond to my calls. Meanwhile, I dialed 9-1-1 with my free hand. I screamed in panic at the operator to please help me. Within 10 minutes, there was an ambulance in front of my house and Jude was sleeping peacefully in my arms. At the time, my knowledge of seizures was practically nonexistent. I remember thinking at that moment that he could end up with brain damage. I remember being taught to keep him upright. I remember thinking that if I held him tight enough and willed him to be okay, I could somehow heal him of whatever was happening to him. I remember watching him turn blue and thinking that he could die. But he did not suffer brain damage, and he is perfectly healthy and happy today. He and I were escorted to the hospital just moments after Jeremy and Jonathan returned in a panic because they had passed the ambulance on the road and just knew it was headed to our house. Jude was giggling and happy within a few hours at the hospital after his fever finally broke. We were released that night and returned home to an un-eaten, cold pizza. Apparently what happened to Jude was not uncommon or even alarming. Apparently, seizures are a common reaction caused by a spiking fever. The fever was brought on by the shots. There are no long term effects and does not mean Jude suffers from a seizure disorder. I don't blame the doctors for what happened, but I do blame them for not preparing me appropriately. I blame them for never asking my opinion on the matter. I blame them for making my feelings seem invalid. I don't care how common or harmless these seizures are; it was devastating to me. Everything turned out okay, and I am extremely thankful for that. But I became a different mom that day. When we become parents, we are ingrained with an amazing ability that helps us to avoid disaster and protect our child. It's called instinct. If you have a bad feeling about something, you have that bad feeling for a reason. Speak up for your child. I didn't, and I blame myself for being too nervous or shy to tell the doctor that I was uncomfortable with five shots. Will I give Jude vaccinations again? Absolutely. Never again will he get more than one at a time, but I do believe that they are a necessary precaution to keep children healthy. Still, I won't get involved in the vaccination debate. I will never tell someone that their concerns are invalid or tell them that they are wrong. We are all concerned with our children's welfare, and this issue is really a double-edged sword. There are rights and wrongs on both sides. My experience has taught me that I cannot let someone else make decisions for me and my children. It's their job to give shots; it's my job to educate myself and do what's best for my family. So, I can't tell you that vaccinations are terrible or great. I can't tell you to avoid them or get them. What I can tell you is: you have a choice, and instinct is useless if you don't listen to it. Wow Jessica that is a heart-wrenching story. I would have done the same thing though. We always assume doctors know best...and I've ignored that feeling that I should speak up and say something before too. I mean who am I to question a physician? We have that tiny little voice inside us for a reason, to protect us! We should all listen to it more. I'm glad you shared this. I will definitely be more cautious as to how many shots are given at one time...when we have another kid...I think Noah is good on shots for a while =) I'm so glad Jude pulled through ok...that is a SCARY situation and I pray it NEVER happens again. I believe our motherly instinct is amazing, as well.... I am so sorry you & Jude went through that... I can only imagine how terrifying (I saw my 1 yr old sister have a seizure when I was 8 and I'll NEVER forget it!). I stay out of the vaccination debate for the exact same reason... as mothers we do what we believe is the right thing... I would never make someone feel uncomfortable for not believe the same thing as I. 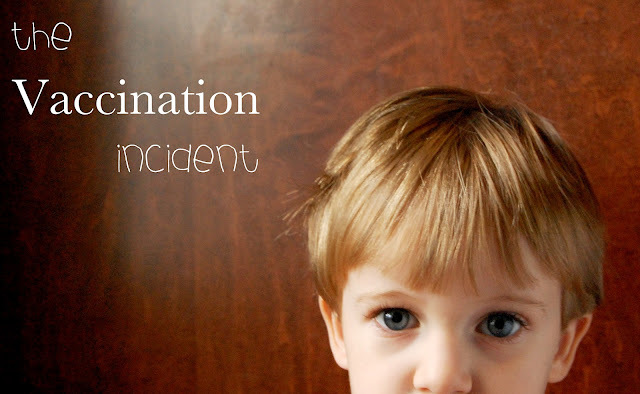 Our kids were vaccinated, and my son was recently diagnosed with autism. There are many that want to blame it on the vaccinations, and sometimes I think "what if" but then I remember in the grand scheme of things, he's FINE and I did what I believe to be the right thing. I am okay with that. Beautifully written post, Jessica... thank you for sharing it with us. Thank you for this great story! It is motivating to know that as a future parent I can take advice from doctors but at the end of the day it seems like it's about moxing that counsel with knowing your kid and following your own advice. A great lesson! What a scary moment! I am glad he is okay in the long run. This is beautifully written! I had goosebumps. I'm glad Jude is healthy, and thank you for sharing your story. Go you for raising voice to the power of listening to your instincts as a mom above all. This is something that wrongly is far too often shoved aside...I appreciate this post! Wow, that is so scary. I actually never knew vaccinations were a huge debate until I started blogging, to me it was always a non-sense, of course you need vaccinations thing but I've learned a lot. I love what you said though about having a choice and following your instinct, I can't believe they'd give a small child 5 vaccines in one go, yikes. Wow. Thanks for sharing that, I'm a nanny for my nieces and I am often with them after their appointments and it's good to know that that happens, I Never knew that, sadly. I also will be passing this onto my sister-in-law. Thanks for being brave and sharing such useful,yet scary information. Ugh, I hate this topic, but thankfully 'Baby Jude' is A-OK! Wow, that is so scary. I'm glad he is fine now and didn't suffer any long-term harm from the seizure. I am a mom of 4 boys and never questioned the vaccination schedule until our 4th baby. I didn't have him vaccinated when he was born and chose to wait until his 2 month appt. But I was shocked that he got 3 shots and an oral vaccination... one of the shots had FIVE different vaccines in it. Just like you, my instinct told me it was too much at once, but wanting to be the "responsible mom" I went along with it. His 4 month appt. is at the end of Sept. and I keep having a feeling that I should look into spacing out his vaccines. Your post was exactly what I needed to read! I HATE getting into conversations about vaccines or anything else controversial about raising kids because the Mommy Wars are TOUGH, and I'm a sensitive Mama... so thank you for a well-written, no-drama, heartfelt post! I'm your newest follower from Naptime Review- hope to see you back on my blog soon! I'm very sorry you and young Jude had such a scary experience. I'm glad that everything eventually worked out and he's fine. I'm newly following from the blog hop. I hope you'll stop by and say hello. I am a strong believer in trusting your gut and going with your instincts. It rarely ever fails you! Although not the happiest story it's these moments that remind you to trust yourself. Thanks for sharing. I got the chills reading your post, I'm so glad your little guy is ok. My daughter had a febrile seizure when she was 18 months after catching a flu from a relative who returned from south America and didn't inform us he was sick (yeah I no longer care if I offend anyone by dumping hand sanitizer on them if they come near my kids). She choked & stopped breathing it was the scariest thing in my life. Thankfully she is fine just like your son, but yes it changes you as a parent. I'm all for spacing out immunizations too, we have to follow our mommy instinct! This is SO scary, but you did all you could as a mom at the time. You live and you learn, and your baby is 100% fine which is what matters most!! I remember Angie's first ear infection and her developing seizures from the temp spike. I freaked out and called the doctor and hopped online. I was able to get her fever down and then antibiotics were called in within an hour. I understand the fear and anxiety you must have been dealing with. I'm glad everything turned out good for you. That is an awful event to have gone through! You're brave to share this. I'm so sorry that you had to go through something like this. It's definitely devastating. I don't have any children so I don't know the degree of fear you must of had. I personally think vaccinations are great but it should be protocol to address EVERYTHING about them even if certain things are uncommon to happen. I can go on and on about this but I won't. I encourage you to always ASK anything about everything to your doctor. I'm glad your son is okay and healthy, that's the best thing to hear! Wow. this is an interesting post. I never considered that parents may have troubles speaking up regarding their kids at the doctor. I was born with chronic asthma and the doctors refused to diagnose me until I was year old. My mother was constantly at the doctors saying there is something else wrong until she finally went to a different doctor that actually said I had asthma. That being said I have been in and out of the hospital for my asthma for so many years and I think because of the way I have seen my mother question and handle doctors I will always question and think twice whenever I take my kid to the doctor. It's a good thing you learned something new. With me being sick it really prepared my mother for her other children when something serious happened.